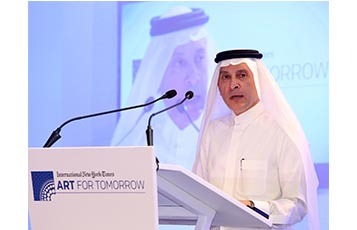 DOHA, Qatar, 2015-3-17 — /Travel PR News/ — Qatar Airways Group Chief Executive, His Excellency Mr. Akbar Al Baker, delivered a keynote speech today at the prestigious New York Times ‘Art for Tomorrow’ conference, held in Doha for the first time and addressed more than 150 international guests. The conference was chaired by Her Excellency Sheikha Al Mayassa bint Hamad Al-Thani. The two-day conference, held at the W Hotel in Doha, explored the changing dynamics of art and architecture and their potential to change people and places. Bringing together guests from the arts, public and private sectors, the conference enabled those present to explore the links between art as a connector in society, with links to tourism, city planning and business development. His Excellency, Mr. Akbar Al Baker, Group Chief Executive of Qatar Airways, spoke today highlighting the airline’s role as a connector of people and the growing phenomenon of art tourism, and also detailing the crucial role that the Group’s cargo business plays in transporting artwork around the world. Mr. Al Baker commented: “Art is renowned and appreciated around the world as an inspiring pillar of society, connecting people to places in their universal appreciation of cultural experiences. With five new destinations on the horizon (Amsterdam, Durban, Faisalabad, Sialkot and Multan), Qatar Airways will soon increase its global portfolio to 151 destinations across Europe, Asia Pacific, the Middle East, Africa, North America and South America. The carrier currently operates a modern fleet of 150 aircraft. At the Farnborough Air Show, the airline placed an order for 100 Boeing 777X aircraft, taking Qatar Airways’ orders to more than 335 aircraft with a value of US $70 billion. For more information, visit our homepage www.qatarairways.com or our sites on Facebook, Twitter, Google+, Instagram, and YouTube. Qatar Airways is the most ‘liked’ airline on Facebook with 9 million fans. This entry was posted in Airlines, Airports, Business, Flights, Transportation, Travel, Travel Management, Travel Marketing, Travel Services, Travelers and tagged Her Excellency Sheikha Al Mayassa bint Hamad Al-Thani, His Excellency Mr. Akbar Al Baker, New York Times ‘Art for Tomorrow’ conference, Qatar Airways. Bookmark the permalink.